In our continuing series of election reports, we are pleased to welcome the following post-election report on Sunday’s Swiss Parliamentary election from Sean Müller and Paolo Dardanelli, both of the University of Kent. Swiss federal elections rarely produce dramatic results but, by the country’s standards, this one was more momentous than most. Some of the major trends that have shaped Swiss politics over the last 20 years appear to have come to an end and a significant change of direction is in the making. The right-wing Swiss People’s Party (SVP/UDC), which had grown relentlessly since the early 1990s, lost ground for the first time while the Greens, the other rising star of Swiss politics, suffered a major defeat. Both parties lost support primarily to start-ups that had broken away from their own ranks. The Radical party (FDP/PLR), formerly Switzerland’s ‘natural party of government’, continued its steep decline followed, to a lesser extent, by the other traditional centrist party, the Christian democratic CVP/PDC. The Socialists, the main party of the left, managed to increase its tally of seats but saw its number of votes also fall. In aggregate, both the right and, to a lesser extent, the left wings of the party system lost ground to the benefit of a larger but more fragmented centre, painting an overall picture of reduced polarisation but higher fragmentation. This is a return to the past for Swiss politics and bodes well for the stability of the country’s institutions, which had been shaken by the polarising ascent of the SVP/UDC. The latter is still by a considerable margin the largest party, securing 54 seats in the National Council, the lower house of the federal parliament, on 25.3% of the vote. However, these represent a loss of eight seats and 3.6 percentage points in relation to the previous election and a clear setback compared to the party’s target of 30% of the vote (see graph). The significance of the defeat becomes even clearer when placed in a longer term perspective. Formerly a centrist, agrarian and Protestant party, the SVP/UDC turned into a right-wing, populist and nationalist party under the leadership of Christoph Blocher, a controversial former businessman. It built a professional campaigning machine and exploited its key themes of zero-tolerance law and order, hostility to immigration, radical Euroscepticism and a general nationalist conservatism to great success. From an average of 10 per cent support throughout the post-war period, the SVP/UDC has become the largest party, winning the highest ever number of seats in the PR era in 2007 (Dardanelli 2008: 749). It also adopted a confrontational stance at odds with the consensual ethos of Swiss politics and tried to inject majoritarian and adversarial elements into it. In the last parliamentary term it even briefly withdrew into ‘opposition’ (Church and Vatter 2009) and launched an initiative for the direct election of the Federal Council, the collegial executive which is currently elected by parliament. For the first time since 1979 the party has not only failed to gain ground but has actually lost support. 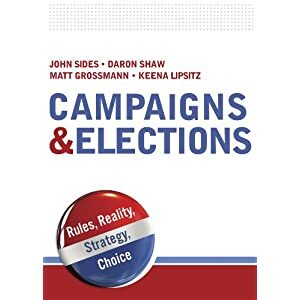 The party’s defeat came in spite of the fact that immigration and related issues were again at the top of voters’ concerns (LT 2011) and it was largely due to the competition from the new Conservative Democratic Party (BDP/PBD). The BDP/PBD was formed in 2008 by a group of former SVP/UDC members following a dispute between the federal party and some cantonal sections in relation to the non-re-election of Blocher to the executive in 2007. Although many were sceptical of its chances of survival in the crowded right of centre space of the Swiss political spectrum, the party has built on its strong roots in several cantons and played on an image of consensus and moderation to considerable success. It has obtained 5.2% of the vote and 9 seats, i.e. more than the SVP/UDC has lost, pointing to the party’s ability to establish itself as a credible political force and attract support from several sources. The Greens were the other main losers of the election. Although their share of the vote only declined by 1.6% in relation to the previous election, they had to surrender five seats, a quarter of their 2007 tally. This means the party has lost a significant amount of the ground it had conquered in the last 10 years and has failed to attract the vote of former Socialist supporters. Even more remarkably, the party has totally failed to capitalise on the saliency of environmental issues, which were the other top concerns – alongside immigration – among the electorate (LT 2011). This is in stark contrast to the trend in neighbouring Germany, where the Green party has profited handsomely from the prominence of environmental issues in the wake of the Fukushima incident. The Swiss party that has managed to do so is the Liberal Greens, formed in 2007 by some cantonal sections breaking away from the left-wing Greens. The party has a centrist position marrying environmental sustainability with social and economic liberalism and has succeeded in presenting itself as a fresh and dynamic force. It attracted 5.2% of the vote and quadrupled its number of seats, from three to 12. Taking into account that, in contrast to the BDP/PBD, the Liberal Greens could not rely on a pre-existent power base in the cantons and are thus a true start-up party, their performance is arguably the most impressive of all. The success of the latter two parties has also come at the expenses of the traditional centrist parties, the Radicals and the Christian-democrats. The Radicals, who dominated Swiss politics for most of the 20th century and were still the largest party in the early 1990s (see graph), were once again among the losers, in spite of their recent merger with the small Liberal party. They gained 14.7% of the vote and secured 30 seats, a loss of three percentage points and five seats compared to the two parties’ 2007 combined tally. The Christian-democrats also lost ground, albeit at a less dramatic rate than the Radicals, polling 13% of the vote and winning 28 seats, a drop of 1.5 percentage points and 3 seats relative to the previous election. The two parties have lost support almost continuously for 30 years and appear unable to find a way of reversing their decline. On the left side of the political spectrum, the Socialists obtained 17.6% of the vote and won 46 seats. Although they managed to increase the number of seats – up three on the previous election – their share of the vote dropped by almost two percentage points. The election results were thus mixed for the Socialists, who have not managed to reverse the fall in support they have experienced in the last decade or to attract former Green voters. This is reflected in the aggregate results by broad political ‘area’. Both the left and, especially, the right wings of the political spectrum lost support to the benefit of the centre ground. The left parties total 61 seats, down 4 on 2007, the right wing obtains 57, also down 6, while the middle-of-the-road parties control 82 seats, up 10 on the previous election. 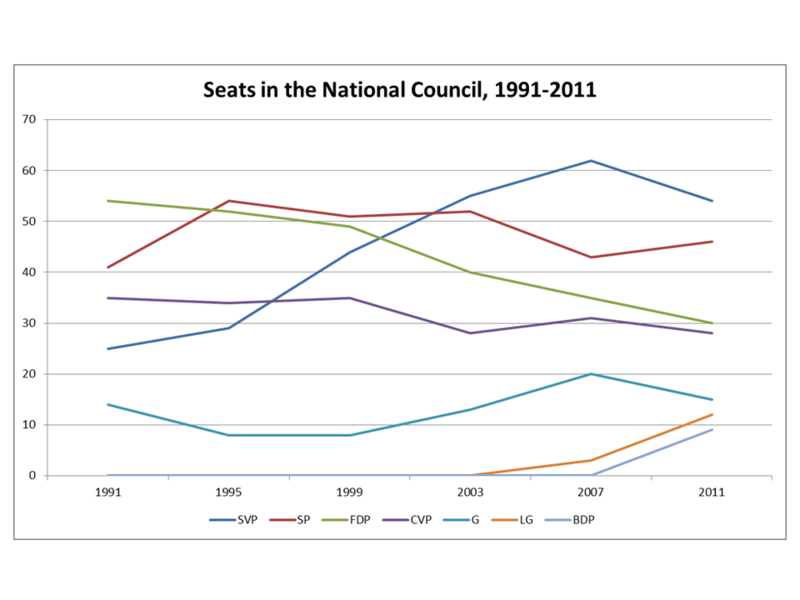 This represent a significant reduction in the degree of polarisation of the party system and a reversal of the established trend since the early 1990s. Combined with the fact that the centrist parties are also likely to retain control of the Council of States, the upper house of parliament, this points to a receding of the threat the SVP/UDC’s rise had posed to the consensual nature of Swiss politics. The other side of lower polarisation is higher fragmentation. The five largest and more established parties have all lost votes to smaller and younger rivals and four of them have seen their share of seats fall. Although only 11 parties are represented in the new National Council against 12 in the previous one, the effective number of parties, measured on the basis of the Laakso-Taagepera (1979) method, is now 5.57, up from 4.97 in 2007. This is also a reversal of a trend under way for some time as the effective number of parties had declined at each election since 1991 (Gallagher 2008) . As already pointed out, fragmentation is especially evident in the centre of the political spectrum where four sizeable parties now vie for support. Electoral volatility, measured by the Pedersen (1979) index, was also higher – 10.7 – than in 2007 whereas turnout was broadly in line with the trend established since the mid-1990s, edging up slightly to about 49%. The results thus paint a picture of higher fragmentation but lower polarisation, signalling a return to the more consensual style that characterised Swiss politics from the 1950s to the 1990s. The new direction is likely to be reflected in the elections for the Federal Council in December, in which the SVP/UDC stands a good chance of re-obtaining the second seat it lost in acrimonious circumstances in 2007 (Dardanelli 2008: 750). This would then bring back to life the so-called ‘magic formula’, according to which the main parties are all represented in the collegial executive in rough proportion to their parliamentary strength. The election’s results thus show the resilience of Switzerland’s political culture and bode well for the stability, for better or worse, of its institutions. Back to a more consensual future indeed. Why Didn’t Qaddafi go into exile? Thanks for this interesting report. Please note that the preliminary voting results, which were used in this article, reported the wrong vote shares for almost all parties. * The corrected vote shares, which were released today by the Statistics Office**, show that especially the larger parties and the Greens scored slightly better than reported. Most of all, this means that the Gallagher index might be a bit lower than reported in this article.